I had a special request (from a special lady) to make moussaka tonight. I haven't made moussaka in a while but the eggplant from this past week's farm share needed to go into something. Why not moussaka? While I know it would not please my Greek grandmother I decided to lean a little west of Greece since I had so much tomato and basil from the farm as well. I made a concassée of tomatoes which I added to some of the sauteed garlic, onion, and chili from the farm. I also added some ground beef and red wine to make a thich hearty meat sauce. Separately I made a white sauce with ricotta, milk, Parmigiano Reggiano, and eggs. 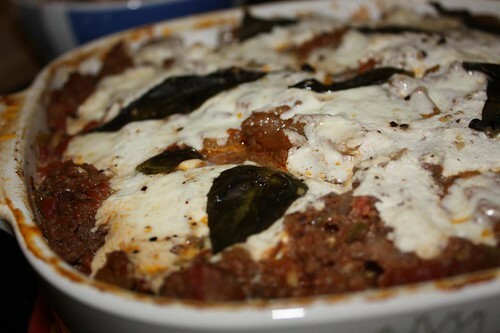 I layered strips of roasted eggplant with the meat sauce, slices of baked potato, chunks of fresh mozzarella, torn basil leaves, and drizzles of the white sauce. I topped with mozzarella, white sauce, and basil leaves then baked it in the oven. It ended up being kind of like a noodle-free eggplant and potato lasagna. It's like fusion cuisine for mental midgets!